Your baby is learning — about you, herself, and the world around her —from the moment she enters the world. At Mothers and Miracles baby and toddler groups, we specialise in creating fun early learning experiences, for Moms with babies and toddlers (3 months – 3 years). Our weekly workshops offer an intimate and nurturing environment where mothers and their young children engage in a range of carefully designed play-based activities that stimulate babies and toddlers to reach their developmental milestones. 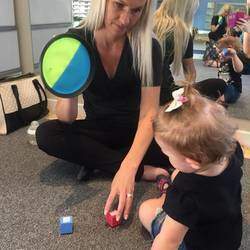 Small groups, led by carefully selected and trained workshop owners who understand the development of babies and toddlers, are designed to optimise the uniqueness and unlimited potential of each child. We have Mothers and Miracles studios nationwide and even one in Windhoek. Spread the word. Visit our website to locate a class near you.